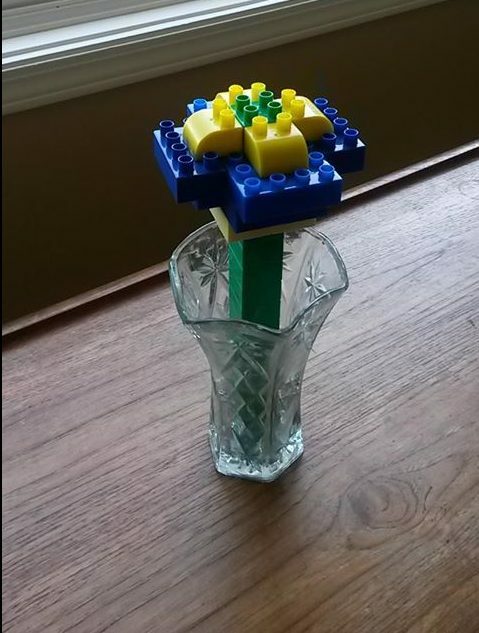 Kids like to make something special for their moms and here’s a suggestion for one to build—Mother’s Day Lego flowers. Made by hand with lots of love. A friend’s son made this for her, which she treated like any other flower and put in a vase. Without the water, of course. This flower means more to her than a dozen of the most expensive roses. What a sweet idea that he came up with all by himself and then made. Making something himself that was so appreciated boasts his self-esteem and strengthens the bond between them. It quite likely even made up for times when his mom accidentally stepped on piece and experienced that sharp pain unique to Lego and Duplo that parents and caregivers can remember forever. Not only was this flower imaginative, it was also engineered. 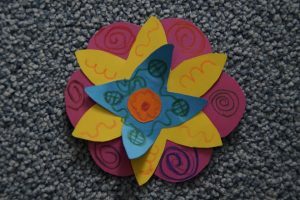 Kids may want to make a flower for mom out of paper, play dough, recycled or other materials. The paper one in this photo is 3 different flower shapes on various colors of paper all stacked together. Fold a pipe cleaner in half and make two tiny holes in the center. Kids can poke the pipe cleaner in the two holes in the center and twist together for a stem. 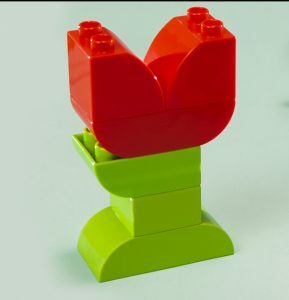 If kids would like to try making Duplo flowers, an easy one is a tulip, with step-by-step instructions and images. This one I might even be able to manage. A much more difficult one is a rose, like the one in the video below. This uses the smaller Lego bricks rather than the larger Duplo ones. The smaller Lego needs more motor control to manipulate than the larger Duplo. 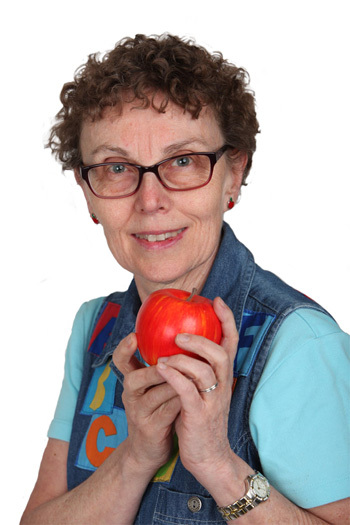 Check on the internet for more ideas but kids will have their own thoughts on how they want to make one. Another idea is to make a vase to hold a glass for real flowers. 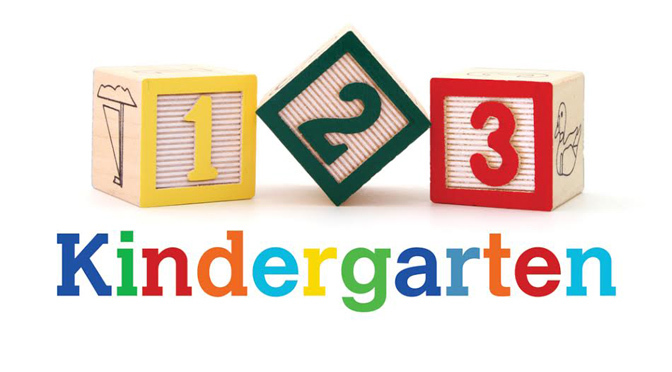 Start with a base and kids add blocks around the edge, leaving a space in the middle. Set a plastic glass inside, add water and flowers. Make sure to pick up the holder by the bottom base for moving it because the water makes the vase heavy! Whatever kids build, Mother’s Day Lego flowers, or some other creation, it will be a gift from the heart. Happy Mother’s Day from Mrs. A at 1 2 3 Kindergarten. For Mothers Day, kids will spend time with their moms. Will there be some time with Mother Nature for Mothers Day? This weekend, some families will make mom a special breakfast. Other families may go out for brunch or dinner. Flowers are very popular for moms too. But how about some nature time? 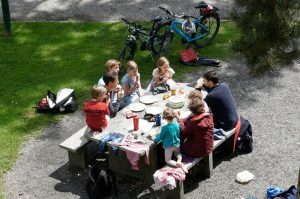 Instead of breakfast in bed, the family could take mom for a picnic. Muffins, fruit salad, sticky buns, and iced tea are easy to make and pack. Take along a tablecloth, dishes, and a blanket or lawn chairs. If it’s a lunch picnic, you could add in some salads, cold meats, fancy bread or rolls, and yummy desserts. Not on the menu but important nevertheless are hats and sunscreen. Does Mom have a favorite park or outdoor area? Weeks can be hectic so a walk can be time to unwind. We all need that. Many communities have wonderful gardens full of spring flowers. These may have admission costs so are like a nature present. 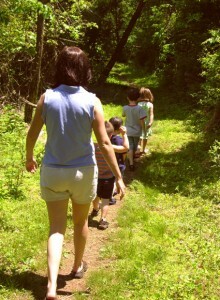 A Mothers Day nature adventure might be to go on a wilderness hike or take a boat ride. It’s maybe a little early in the year for outdoor swimming, but could be a good time for beachcombing. Dads aren’t the only ones that like to fish, some moms like to do that too. Especially if someone else cleans and cooks them. A sunny day with a bit of a breeze is great for a bike ride or flying a kite. Time in nature has so many benefits. Being outside gives energy levels a boost and reduces stress and anxiety. For the body, nature time lowers pulse and blood pressure, and for the brain, it increases calm brain waves. For both children and adults, a connection to nature restores our own nature. We are more creative and positive after being in the nature-zone. Spending some time with Mother Nature for Mothers Day is a gift for the whole family. What can your family do? Hand-made cards are treasures that mothers keep for years. Here are some bubble art Mothers Day cards kids can make at home. 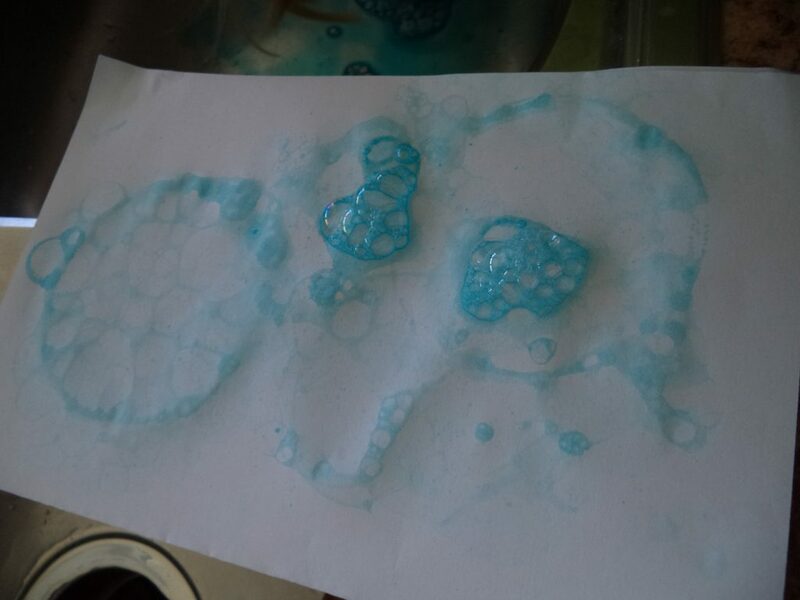 There are several sites that suggest blowing colored bubbles and dipping a paper into them. I’ll admit to being skeptical about this.The bubbles don’t look colored, so how can they leave a color on paper? Transparent bubbles won’t show up on white or colored pages. But Little Sister said she’d done this at daycare so we tried it at home. We didn’t have powdered paint like daycare, so instead we squeezed some paint from dabbers into a small plastic dish, added some water and a couple of squirts of dish soap. 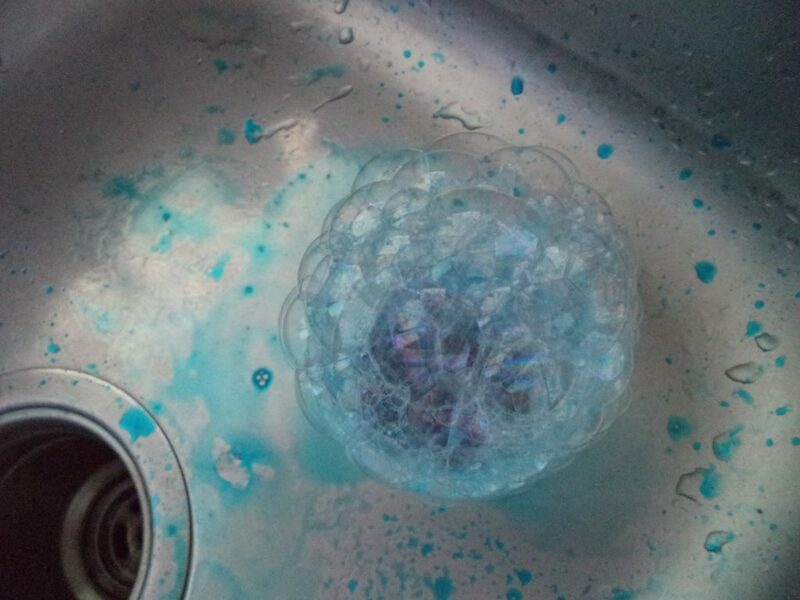 Just in case some bubbles escaped, floated across the kitchen, and popped in the air, I put the dish in the sink. Little Sister stood on a chair and used a straw. 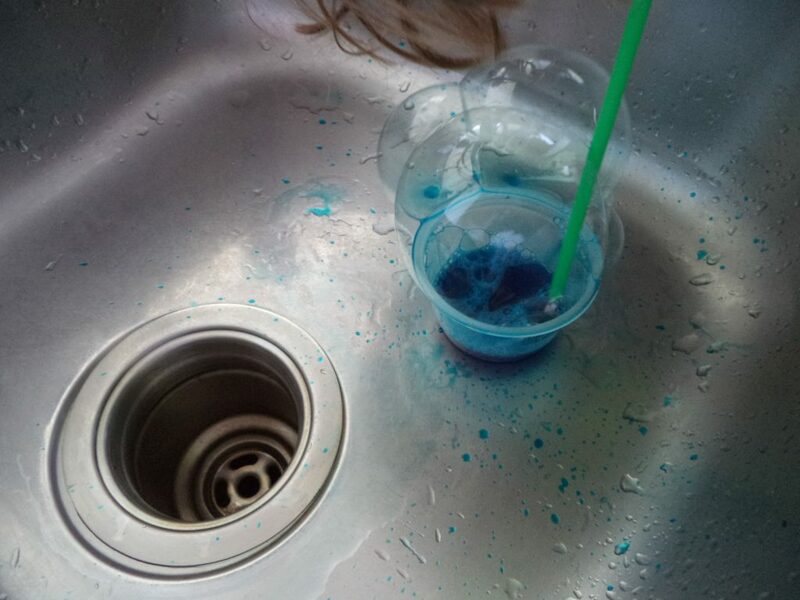 She blew into the solution until bubbles were overflowing the dish. 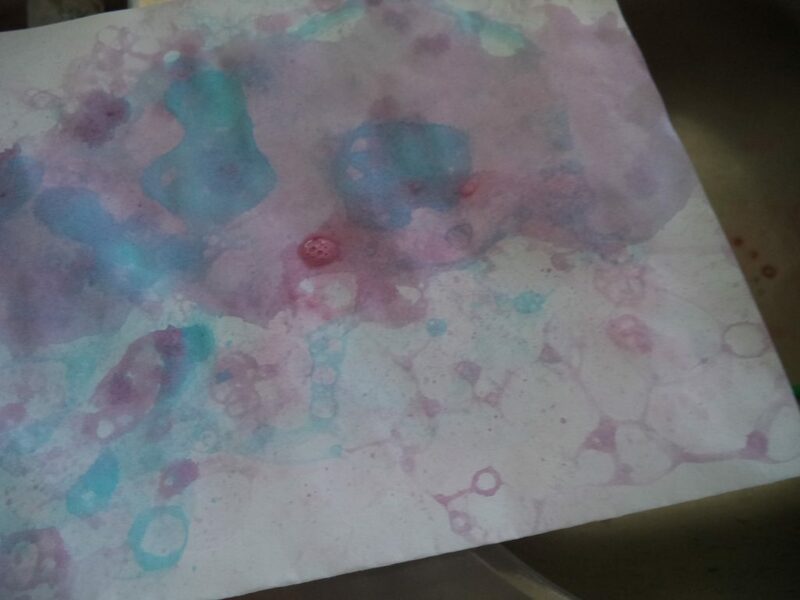 We touched the paper to the bubbles and then turned it over. The bubbles did leave lines and shapes of colors on the page! After a few repeats with blue, we tried with red color, water, and soap. 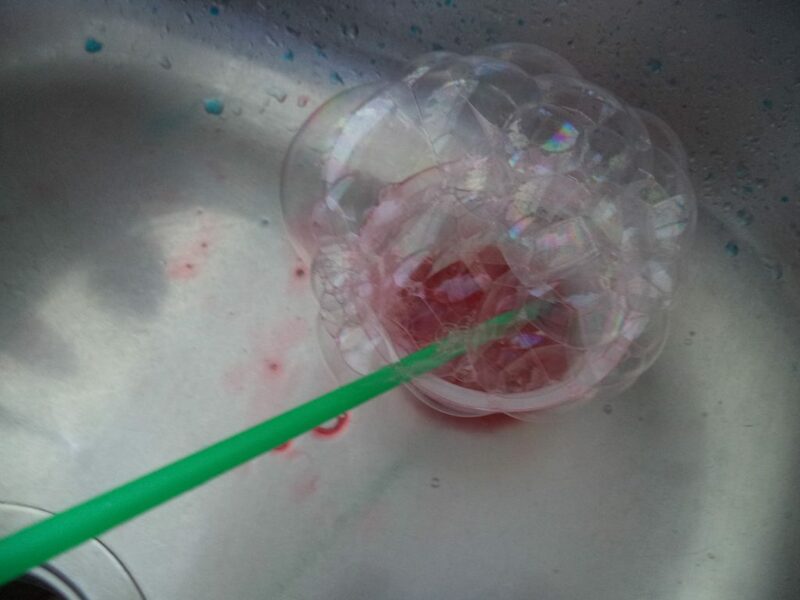 You may need to remind kids to put the straw all the way to the bottom of the dish before blowing to get bubbles. Big Sister wanted to use colored paper for her card and chose pink. It’s hard to see in the photo but the bubbles made a light marble effect on the pink. Next time, we will use much more paint, less water, and maybe a few drops of food coloring too. Liquid paint is another possibility with a bit of liquid soap. Extra water may not be needed. Now that we know how the process works, it will be fun to try bubble art with some different solutions. Once the paper is dry, kids can add their names, happy faces, hearts, and any messages. 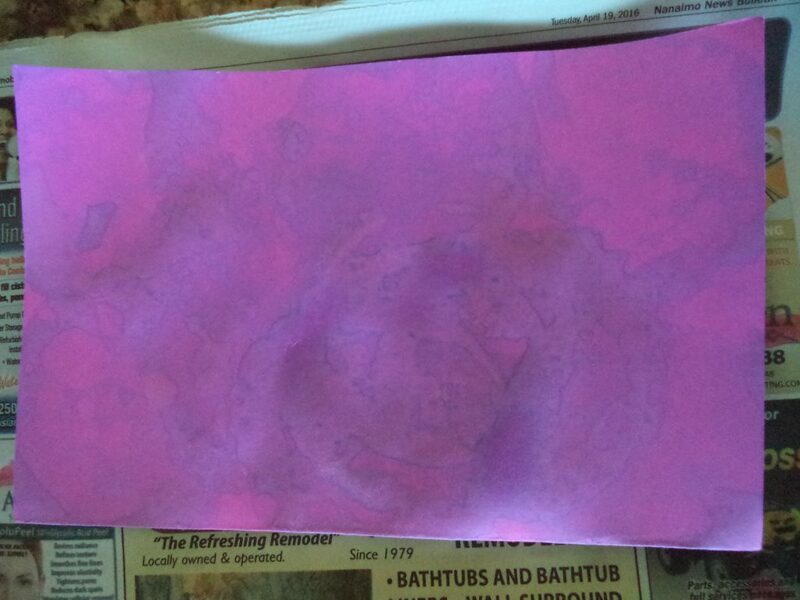 These bubble art Mothers Day cards were a much easier project than I thought. 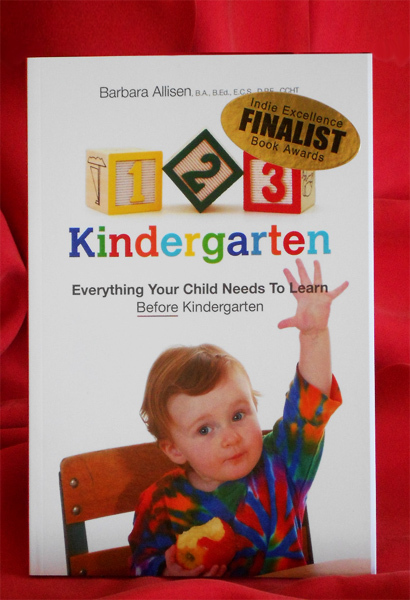 Will you and your child give it a try?